The Sinokoko P5H series of linear actuators are high-torque DC motors geared to push or pull a load along the stroke of the actuator. This actuator comes with a built-in potentiometer, allowing your application to monitor the actuator's position. 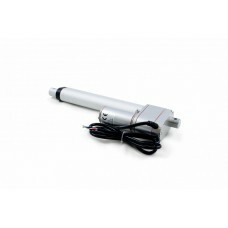 The 3545 linear actuator has a stroke length of 150mm, can move at a rate of 24 mm/s and can extert up to 350N of force at lower speeds. See the compatible products Tab. Can be used in line with the Phidgets 1065, 1064 and DCC1000 motor controllers. Ask us when you need any help with this product. Description: The PhidgetMotorControl HC (1064_1) allows you to control the angular velocity and.. Description: The PhidgetMotorControl 1-Motor (1065_1B) lets you control the direction, velocity..